Tobias “Toby” Wolff, a pre-eminent short story writer and memoirist, as well as a former English professor in the College of Arts and Sciences, and internationally acclaimed theater artist Ping Chong, who wrote and directed two Syracuse Stage world premieres, are being awarded the National Medal of Arts. They and nine other medalists will be recognized by President Barack Obama at a special White House ceremony on Thursday, Sept. 10. The National Medal of Arts is the highest award given to artists and arts patrons by the federal government. The California resident has many other honors to his name, including two PEN awards (1985 and 2006) and The Story Prize (2008). He also is involved with The Big Read, an initiative of the National Endowment for the Arts that develops community-wide reading programs around the country. 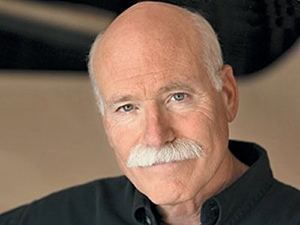 Wolff’s time in Vietnam inspired him to channel his wartime experiences into the novella “The Barracks Thief” (Ecco, 1984) and the memoir “In Pharaoh’s Army: Memories of the Lost War” (Vintage, 1995). Other books Wolff published while at Syracuse were “In the Garden of the North American Martyrs” (Ecco, 1981), his first collection of short fiction and the memoir “This Boy’s Life” (The Atlantic Monthly Press, 1989). Chong was a writer/director for two world premieres at Syracuse Stage: “Tales from the Salt City” (2008) and “Cry for Peace: Voices from the Congo” (2012), a work co-written by Syracuse Stage dramaturg Kyle Bass that transferred to New York City’s storied La Mama Theatre. 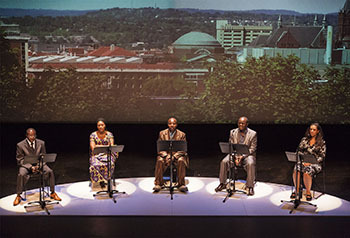 These works connected Syracuse Stage to the Central New York community in unprecedented ways by featuring stories of recent immigrants and refugees who call Syracuse their home. Extensive partnerships with Syracuse University and other organizations enhanced these productions by helping to create profound and meaningful dialogue. “Tales from the Salt City” and “Cry for Peace: Voices from the Congo” were part of Ping Chong’s “Undesirable Elements” series, first produced during a residency at Artist Space in New York City. Since 1992, Chong has created over 40 productions in the series, in communities around the United States and abroad. Though hard to define, the term “documentary theater” is perhaps the best way to describe “Undesirable Elements,” which uses real people, not actors, telling their own stories from a script based on interviews with the writers.